Did you know that a child’s ability to love and connect is shaped after birth? The way you parent your child actually influences the way her brain cells wire together to form the circuits she’ll use in social situations throughout her life. This is an awesome responsibility. Luckily, it’s not that hard. Many of the things you naturally do to care for your child help shape a healthy oxytocin response. Unfortunately, some common childrearing practices do more harm than good. These mistakes can train your baby to believe that the world is a scary, uncomfortable place. And these attitudes can persist throughout life, limiting your child’s ability to experience love, joy and connection. Oxytocin Parenting is an approach that helps you use your natural inclinations to create a warm, safe connection with your baby and, as she grows, teach her how to love and trust appropriately and safely. Oxytocin Parenting: Womb through the Terrible Twos helps you understand what’s happening inside your baby’s brain. It contrasts traditional views of parenting practices with a better way: Oxytocin Parenting. You will learn to parent softly in a way that feels good to you and to your child. 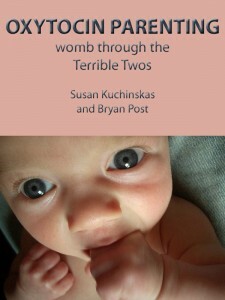 Oxytocin Parenting by Susan Kuchinskas and Bryan Post is available for the Kindle on Amazon for $2.99. Order Oxytocin Parenting from Amazon now. Do you prefer iOS? Order Oxytocin Parenting for $1.99 from iTunes.